The Big Racket is easily one of the most entertaining and action packed poliziotteschi to ever be made. While the plot is relatively simple and in ways deals with similar elements explored in Violent Rome and Violent Naples, the film stands out as being particularly memorable and epic. Such a fact is achieved through a number of colorful characters, clever and sometimes humorous dialog, and extremely well shot Peckinpah-esque action scenes. In fact, next to the almost as equally entertaining Keoma, the movie features what are quite possibly the best shootouts ever filmed by director Enzo G. Castellari. In fact, the film's climax, despite featuring some paint ball like squibs in some shots, is one of the best action scenes in all of cinema. 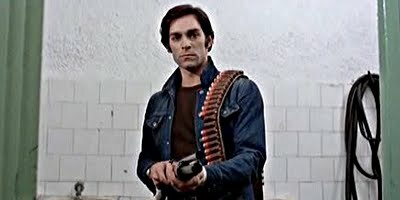 While a little harder to take as seriously as High Crime or Street Law, The Big Racket proves that Castellari was one of the finest directors working in the crime genre during the 1970s in any country.